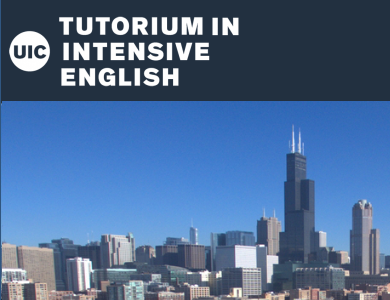 Established in 1978, the Tutorium in Intensive English is known for its professional faculty, quality instruction, competitive fees, and convenient location on the diverse, urban University of Illinois Chicago campus. Our reputation for excellent instruction and service brings hundreds of international students to Chicago each year. The Tutorium in Intensive English is located on the campus of the University of Illinois at Chicago, the largest public, research University in the Chicago area. Just a mile from the city center, the Tutorium offers a variety of field trips and activities designed specifically to help students explore and experience American culture and life. Midterm entries are available on a limited basis. Inquire now to get started. Note: Only full-time (20+ hours per week) are eligible for a Form I-20. Part-time students do not qualify for Form I-20 issuance. *Health Insurance: All students are required to have health insurance. Check the website for exact costs and details. Dependent Expenses: The estimated expense per month for the first dependent is $700, and $500 for each additional dependent. You are also advised to buy health insurance for dependents. Contact the Tutorium for current cost. How to Apply to the Intensive English Program: Complete and submit the Application for the Intensive English Program on the application page of our website. Directions for completing and submitting the application can be found there. English for International Professionals Series (EIPS) is for non-native English speaking professionals and academics who have finished their basic English studies but wish to improve specific language skills for social, academic, and professional settings. Our experienced faculty provide high quality feedback and individualized instruction in small group classes. EIPS courses are open to intermediate- and advanced-level students over the age of 17. All courses are part-time, and most classes meet in the evenings or on weekends. EIPS offers classes conveniently located on the UIC campus, as well as self-paced online courses. For course dates, fees, and additional information, please visit tie.uic.edu/eips. Please note: Our EIPS courses (including the TOEFL preparation course) are not full-time courses, and therefore do not issue Form I-20s. Chicago, Communication, and Culture is a 3-week summer English language program for tourists and visitors to Chicago who want to explore the city while they improve their English. The program is designed for students with a basic knowledge of English who are interested in building on their skills. If you have never studied English before, you will not benefit from this program. You need to be able to speak and understand English at an intermediate level. One hour of classroom instruction in the morning, followed by instructor-guided city tours and activities in the afternoon. This is a part-time program and does not issue I-20s. Activities include: a Chicago River boat tour, museum and art gallery visits, a visit to one of Chicago's famous skyscrapers, and watching the World Series Champion Chicago Cubs play baseball. Fee: Please see our website for exact prices. There is a significant discount for early registration (pay by 2 April). The fee includes all course materials, city tour fees, and admission to a Chicago Cubs baseball game. Housing: Accommodation in a furnished residence hall on the University of Illinois campus is available for an additional payment of $985. Housing payment deadline is mid-June. The Tutorium's Intensive English Program is accredited by CEA, the Commission on English Language Program Accreditation, through the year 2027. We are also members of the Association of American Intensive English Programs (EnglishUSA), University and College Intensive English Programs (UCIEP) and NAFSA: Association of International Educators.